It was cold! We darted up to the Big Bear Lake area just in time to catch a surprisingly potent overnight storm, plus a very un-SoCalish 10° F day at Snow Summit. The Bear resorts are now proudly declaring they've got better conditions than at any time last year, and with a foot of fresh powder, who can argue? The Wall should be open this weekend, if it's not already. Conditions may be firing in the San Bernardinos, but in the San Gabriels, Mount Baldy reports only a paltry 6-12 inch base. Chair 3 (Thunder Mountain) is open, if you dare. Back here at home, we finally broke our record-setting string of downtown highs of at least 60 degrees. That's right: Tuesday's high of 56 degrees was the first time in 375 days that Los Angeles saw a day below 60. Let's head north: our New Year's storm didn't pack much punch for Mammoth (basically no punch), but coverage is solid, if uninspiring, with a rangy 30-48" base. Howard's long range has nothing exciting on the radar—another of those flurry-type events in a week or so. 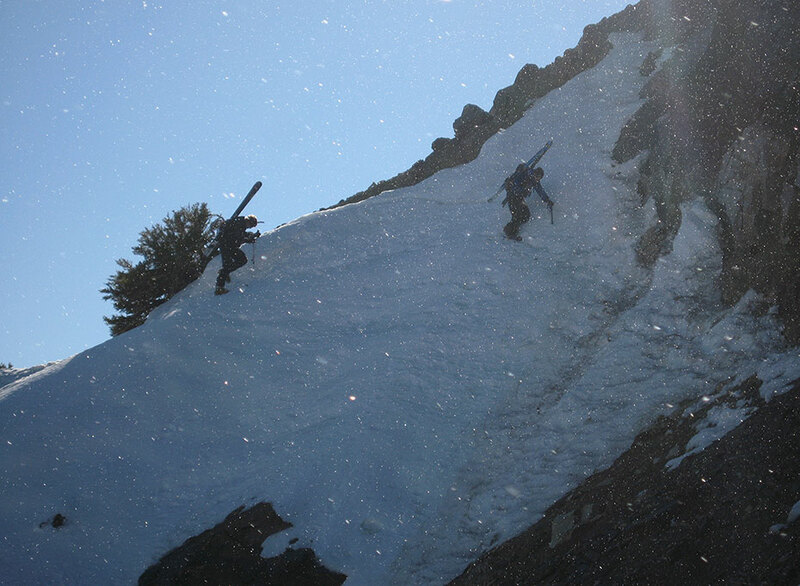 In the Sierra backcountry, Sue continues to search for enough snow to assign a danger rating. And what of the SoCal backcountry? I am basically ready to call San G open for business. Probably I should put my boots on and tromp out there and see for myself, but I've got a crazy mind to go climb Mount Baldy and see if anything is happening up above 9K or so, so that may be my priority instead. San J would be the easiest scouting mission, but probably also the least likely to be doable. Remember, extreme cold plus snow plus wind equals trouble no matter what your latitude is (and especially so in the Sierra!). Give all the big (and little) faces your utmost respect until things heat up a bit, at which point you should probably continue with the respect thing...I mean, they are mountains, after all. Happy 2015! SS now reporting the Wall and Olympic are open. This last storm is the kind you pray for to but after a base is established, this was too early for that. But it is the base we needed to make for a fun day locally for the advanced board smith. Look for Side Chute and Dicky's to open for the full SS experience missing last year. And pray for more snow so the little hidden stashes open open up. Curious to here about the BC but below 9k I would guess is marginal. I'm probably 2 weeks away from breaking in SS pass per ankle injury but so far looks promising for full recovery. TG I already have 5 excellent days in, 3 in full pow, to dream on til next time. I'm thinking of heading to baldy tomorrow and hiking up to see what's happening as well. I'll take all my gear, and hopefully get to use it. Would be nice to get some turns in on the bowl. Maybe ill see you tomorrow. Just finished a M-Th trip to SS, xlnt conditions. the Wall and Olympic were both half open, only skiers left of the chair on the Wall was open and the lower steep section of Oly was closed. Neither were very good, as Andy's picture shows they blew massive amounts of snow on it and it will need some grooming work. They are even anticipating opening chair 5, when was the last time you saw that? #10 was open for the first time since spring 2013 and was outstanding, lines were very short or non-existent. Hiked Baldy today via Ski Hut and descended Devil's Backbone. Nice hiking conditions but I didn't see a lot of skiable coverage. Snow conditions were nice, not insanely icy, but coverage on the bowl only looked to be about 25%. Snow depth was also mostly shallow where there was any, in the 12" range except for some deeper drifts. Sadly, everything near the road was a wreck with snow players leaving trash everywhere, and the Porta potties absolutely shameful. Seems like the Forest Service could have predicted the heavy usage and scheduled an extra service or two on the porta potties... pretty sad stuff. Curious how you managed around that hairpin turn section above the steep chute on descent. I feel calling search and rescue just hiking by it in fair weather. Simple traverse or axe +++? I got a late start yesterday, hiking boots to the ski hut, then skis/skins about halfway up to the saddle. Went to crampons as the icy stuff made the skis/skins more work than needed. I skid from the saddle back down close to the hut, staying right inside the treeline. It was A mix of boot top powder and hard crust. More enjoyable than I expected, as I got some good edge bite in the hard crust, and the shadowed powder hadn't been thru a melt freeze. A lot of work for a few minutes of turns, but a good workout and weather was good. Could have used more snow..... As usual in the CA mountains. Brad, just traversed it. I had microspikes and it wasn't much worse than in the summer. Having never done Baldy in winter, I was definitely worried about this spot and left enough time to turn back in case it was sketchy, but there was minimal enough snow that it was fun but not scary with careful footing. Looking down, I didn't see continuous enough snow/ice below me that I felt like a fall would have been uncontrollable. That was basically my go/no-go criteria. Similar with the backbone. I am not a super daredevil but have done some climbing so my threshold might be a bit elevated. I.e., passed a group going the other way that was super sketched out and thought it was icy. That said, I can definitely see this section being harrowing if the slope was completely filled in with snow. I would not head down the backbone route without enough time to backtrack, given the chance it's not passable. Yep, it's weird how the near south or low altitudes can sometimes get better snow than where should have. BTW, forgot to mention that vid was New Years Eve, last Tuesday. The snow on the roofs in Murrieta and Lake Elsinore was yesterday . . . still. Get the shivers just thinking about slip sliding away on Baldy ice. Also. just heard we lost 2 US ski team members in Austria. Apparently they were skiing as a group, found a pow stash and triggered the avie, 4 others got out. Apparently the avie risk was high. I'm guessing BC protocol issues were involved reading between the lines of the radio report. Sounds like 6 skiers hit it at the same time but not sure.